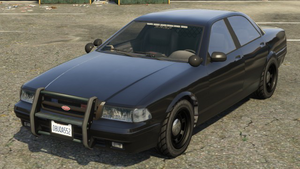 The unmarked Cruiser in GTA V.. The Unmarked Cruiser has several police lights. Two lights are located in the grille, a strip is located on the front window, and two smaller sets are located in the left and right corners of the rear window. The front of the car retains the push bar from its marked counterparts. In addition, its taillights flash in a similar manner to the Police Cruiser. In terms of performance, the Unmarked Cruiser is similar to its marked counterparts. It has decent acceleration, top speed, and like its other variants, it handles surprisingly well for a large bulky sedan. The vehicle can also sustain heavy damage before failing. This page was last modified on 25 April 2015, at 20:38.